Hola Amigos! Experience authentic music styles of the Afro-Spanish-Caribbean by Puerto Rican-born author & bi-lingual educator, Alejandro Jimenez. Connect with educational philosophies and cultural backgrounds of the Spanish Caribbean to understand how they influenced the music of that area. Learn how song, dance, rhythmic instruments and drama all come together to help build confidence and promote personal expression. 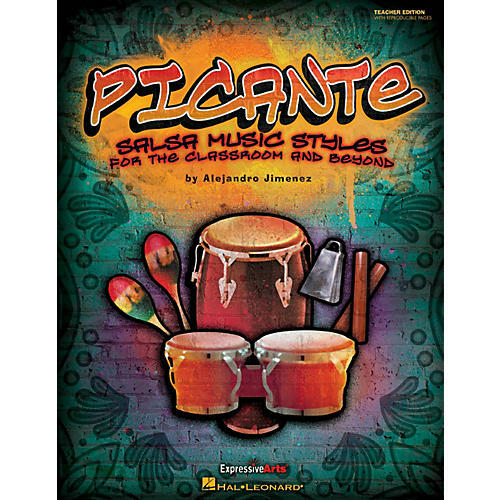 Originally developed and used in urban, multi-cultural settings here in the United States, the works featured in Picante are for all general music classes. Students form their own Latin Music ensembles and explore the highly rhythmic beat of the plena from Puerto Rico, the regueton which is popular among urban Latino youth, the fast two-step beat of the merengue from the Dominican Republic, the bomba from Puerto Rican folk music, and the son from Cuban dance music. These different styles influenced what we now call Salsa music. The kid-friendly ensembles have been written for Grades 5-9 and are presented from easy to more difficult. A variety of short, easily-learned ostinato rhythm patterns are played on Latin percussion and Orff instruments and added one at a time, followed by the Spanish and English lyrics. These voice parts are also made up of short ostinato patterns that, when layered in, create easily-sung harmonies in an instant! You can perform all or some of the voice parts, so do what best fits your situation. A helpful teaching sequence, dance steps and objectives linked to the National Standards are provided for each song, and all ensemble parts are reproducible! The piano/vocal printed score represents the form of each song as recorded on the companion CD, and is only a suggested guide to follow. Encourage your students to be creative and make up their own song form! Available separately: Teacher Edition (with reproducible pages), Performance/Accompaniment CD, Classroom Kit (Teacher and P/A CD). Suggested for grades 5-9.